Asked whether he's disappointed his prayer did not work, Rabbi Pinny responded. "G-d always listens and I'm sure we received a very special blessing." "We asked for a win last night but perhaps after the victory the Panthers get swept in the second round and everyone's still disappointed. 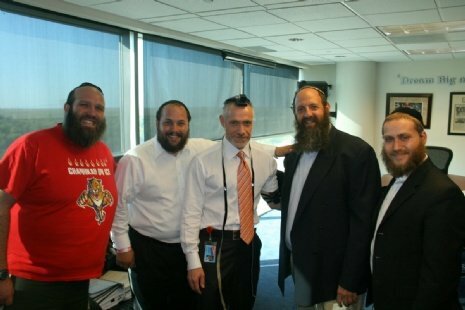 So G-d took yesterday's blessing and is going to combine it with our future prayers so that instead of multiple second place finishes, a Stanley Cup Championship is in the very near future." Or as Shuey Biston suggested that perhaps there were some good rabbis in New Jersey praying for the Devils and G-d doesn't take sides, especially since Florida already has the weather and the Heat. "I'm sure people also wonder whether it's proper to beseech G-d for something so trivial as a hockey victory?" Rabbi Pinny said. Our mission is to infuse G-dliness, goodness and spirituality in everything we do and to the most mundane places on earth. To witness the president of a national sports franchise place a mezuzah on his door, don Tefillin and say the Shema hours before his team's biggest game in history plus see thousands of Jews flock during a playoff game for kosher food and a Minyan is what I believe is our mandate of making our surroundings a more G-dly place and preparing the world for the coming of Moshiach."